Not to be confused with the Anglic Scots, Scottish Gaelic is a Celtic language descended from Old Irish. 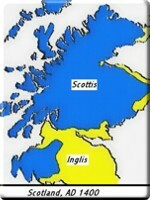 The traditional language of the Gaels (or Scotti, as the Romans called them), it became the historical language of Scotland after replacing older northern languages such as Cumbric, Pictish, Old Norse, and Old English. Scholars disagree on how long Gaelic has been spoken in Scotland; some sources suggest that the language was spoken in Argyll before the Roman period. However, the fourth century consolidation of the kingdom of Dál Riata, which linked the ancient province of Ulster in northern Ireland with south western Scotland, accelerated the expansion of Gaelic, as did the success of the Roman Catholic Church, which was introduced to Scotland by Irish missionaries. Gaelic was the language of the Royal court in the ancient period, but began to decline in mainland Scotland by the beginning of the thirteenth century. 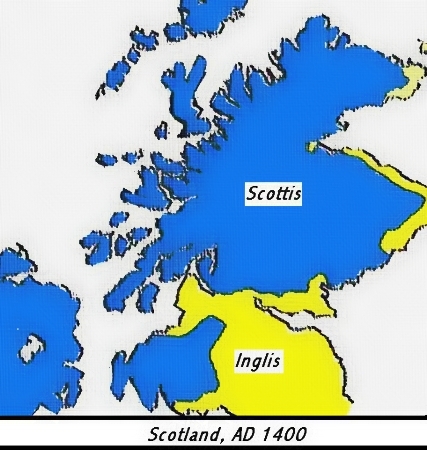 As bards and nobles turned increasingly towards the English-derived Early Scots, Gaelic's status as the national language waned until it was eventually displaced in the Lowlands. By the fifteenth century, the cultural divide between the Highlands and the Lowlands was beginning to emerge, with the former adhering to its ancient Celtic heritage while the latter merged more closely with its English neighbours. This pattern continued until Gaelic suffered a crushing blow in the eighteenth century. Following the Jacobite defeat at the Battle of Culloden in 1746, the British government sought to destroy the ability of the Highlands to rebel by assimilating the region into English custom. Among other types of oppression was the ban on the Gaelic language. During the last half of the eighteenth century, over a quarter of Scotland's population spoke only Gaelic. That total had decreased to 18.5 percent by 1800, and it continued to plummet throughout the nineteenth century. The language suffered a further devastating setback when Parliament passed the Education (Scotland) Act in 1872, which made no provision in the new national educational system for Gaelic. When the Act was passed, almost one quarter million Scots were still monoglot Gaelic-speakers; however, without any Gaelic instruction in the classroom, that figure plummeted fivefold within a generation. By the Second World War, only 2-3% of Scots still spoke any Gaelic. The 2001 UK Census showed that there remained only 58,652 Gaelic speakers in Scotland (1.2% of population over three years old). Compared to the 1991 Census, those figures showed a diminution of approximately 7,300 people (or 11% of the total Gaelic-speaking population), meaning that the language continued to decline in Scotland into the new millennium. 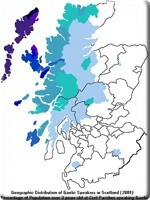 No community in the Highlands or Isles had a proportion of Gaelic speakers greater than 75%, and no community in mainland Scotland had a proportion greater than 20%. The main stronghold of the language is in the Outer Hebrides, where the overall proportion of Gaelic speakers remains at over 50%. 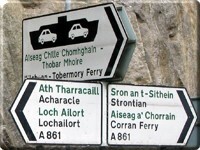 The only other areas with significant proportions of Gaelic speakers are the islands of Tiree, Skye, Ramasay, and Lismore in the Inner Hebrides. Out of the 900 parishes that make up Scotland, only 9 have a proportion of Gaelic speakers greater than 50%; 20 have a proportion over 25%; and just 39 have a proportion over 10%. Only after Gaelic was in danger of becoming extinct in Scotland did people begin to make efforts to ensure its survival. Long suffering from its lack of use in educational and administrative contexts, Gaelic finally achieved a degree of official recognition in 2005 when Scottish Parliament passed the Gaelic Language (Scotland) Act. The first piece of legislation to formally recognize Scottish Gaelic, the act intended to secure Gaelic as an official language of Scotland that commands "equal respect" with English. It provided for the establishment of a statutory Gaelic development body, Bord na Gaidhlig (BnG), as a part of the framework of the Scottish Government, to develop a national plan to provide strategic direction for the development of the language. The BnG is also responsible for promoting the use and understanding of Gaelic, guiding education authorities on Gaelic education, and for requiring public devolved bodies to develop Gaelic language plans in relation to the services they offer. 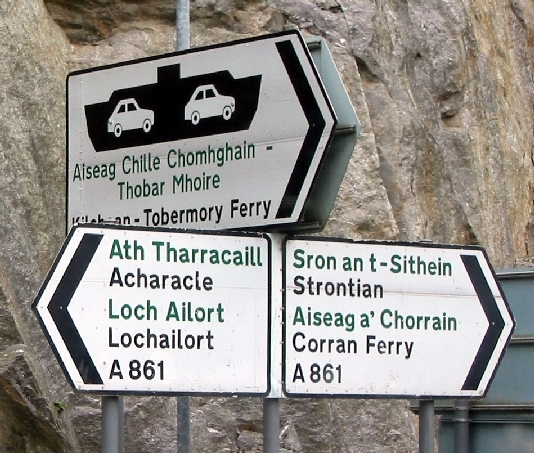 Moreover, the British government pledged to take a range of concrete measures in the fields of education, justice, public administration, broadcasting and culture in regard to the Gaelic language, by ratifying the European Charter for Regional or Minority Languages in 2007. The first modern Gaelic-medium secondary school, Sgoil Ghàidhlig Ghlaschu (Glasgow Gaelic School), opened in 2006. In the 2006-7 school year, a total of 2,092 children were enrolled in Scotland's sixty-one Gaelic-medium primary schools. After centuries of suppression in schools, Scottish children are finally receiving access to their nation's historical language. In addition to ensuring that students have sufficient opportunity to learn Gaelic, the BnG is also working to introduce Gaelic media into Scotland. In 2008, BBC Scotland launched a division for Gaelic-languages services called BBC Alba, which operates a radio station, television channel, and website.